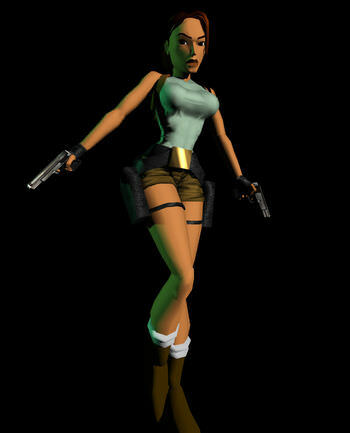 Paramount Pictures’ Angelina Jolie-led “Tomb Raider” film franchise limped off into the night in 2003 after just two entries; even the most cynical observer might not have guessed it was still early days in the hellscape of video game to movie adaptations. 2016’s “Assassin’s Creed” dared find a new bottom to the barrel, even with expectations so low that a mildly diverting adaptation might have elicited the same reaction as a NBA Finals-winning buzzer beater. On the surface, that’s what Warner Bros. and MGM’s “Tomb Raider” reboot is: not outwardly embarrassing. When’s the parade? Oscar-winner Alicia Vikander (“The Danish Girl”) competently fills the boots of reimagined title character Lara Croft (developer Square Enix mercifully retired the heroine’s original look in 2013 for something appreciably more modern) and a couple of the film’s action sequences resemble the best of the series’ gameplay – enough to cut a trailer, at least. But raise the bar at all and “Tomb Raider” 2018 unravels. Geneva Robertson-Dworet and Alastair Siddons script is a skein of mid-2000s origin movie clichés (think “Batman Begins” but without the heart, scope, subtext, or thrills) tied together by a director (Roar Uthaug) with no detectable personal imprint. The arrow-slinging fun hinted at in the film’s ad campaign is almost non-existent in the final product, put to shame by the virtually non-stop barrel-exploding action that comprised the beloved 2013 game and its equally acclaimed 2015 sequel. At least the soundtrack is Bono-free. Act one sees Lara Croft rise from reluctant heiress working as a bike courier to action-adventure superwoman. Her transformation is perfunctory at best. In discovering a videotape left by her long-lost billionaire father Richard (Dominic West) that reveals his true calling – archaeology – a switch is flipped inside our already chiseled protagonist. Her apathetic streak evaporates, leading her to an alcoholic Chinese ship captain named Lu Ren (Daniel Wu) and then the island of Yamatai, where her father may have been looking for the tomb of Himiko, an ancient queen said to possess magical restorative powers. Here Lara runs into Matthias Vogel (Walton Goggins, “The Hateful Eight”), a sniveling archaeologist with predictably bad intentions for the aforementioned tomb. He enters as an immediately tragic character; not because he’s scripted that way, but because he’s such a void of charisma and substance, wasting both Goggins and our time. The longtime character actor can be an extraordinary screen presence when paired with the right material. In this case, however, he appears to be narcolepting his way through a role that deserves it, plainly aware of how unconscionably dull a movie he’s in. Even if Hollywood never finds the missing link between the interactivity of video games and the relative passivity of movies, there’s no excuse to play a property as malleable as Tomb Raider this close to the vest. The video game series is arguably at its creative peak, swimming in the kind of adrenaline spikes most blockbusters would kill for. A boring “Tomb Raider” movie should be an impossibility. Now there are three of them.